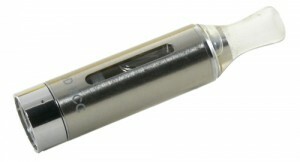 The EVOD Bottom Coil Cartomizer (BCC) is the latest in a series of clearomizers from Kangertech. The design shares the replaceable bottom coil design with the slightly larger T3 line of clearomizers from Kangertech, the M-T3 in particular. The most notable difference is that the EVOD is more compact, both in width and length, and although the atomizer bases look similar, they are different as well. The unit consists of two main pieces which screw together at the bottom. The body consists of an outer tube that holds the e-liquid and an inner tube through which the vapor is drawn. The top of the body has an integrated mouthpiece that is not detachable. 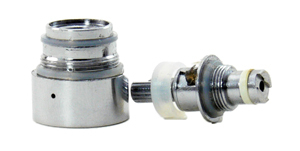 The atomizer coil assembly has a short tube that inserts into the inner tube of the body and a base that screws onto the bottom of the body. Two stubby wicks protrude from the base of the tube and lie at the bottom of the tank when the unit is assembled. 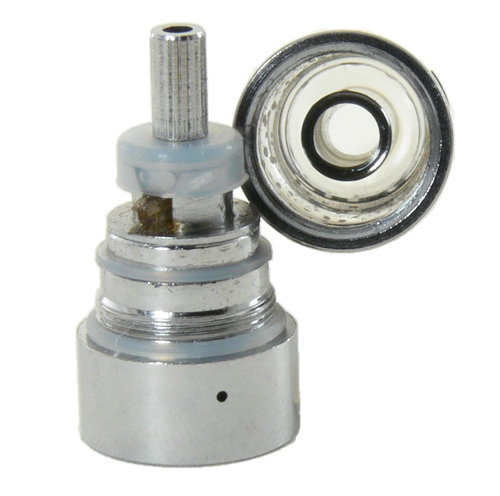 The atomizer and wick assembly can be removed from the base for replacement, resulting in a very inexpensive way to keep things fresh. The bottom of the base has threads around the inside that are compatible with a standard eGo battery connector. 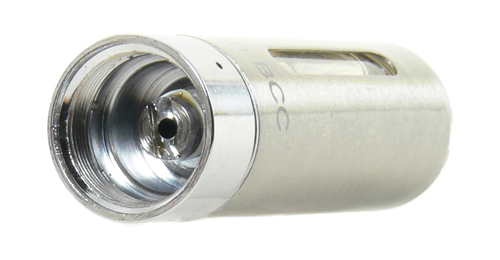 Note that the inner positive post is not threaded, meaning that the EVOD BCC will not work with a standard 510 connection without an eGo adapter. The depth of the center post has worked perfectly with most devices we’ve tried it on, although it was apparently too recessed to make contact on an Evic. Filling the tank is simple, if just a bit ungainly. 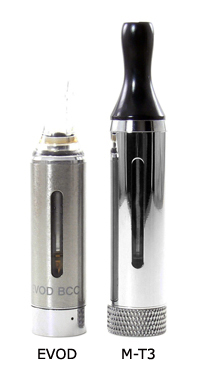 Once the bottom coil is removed, the tank is inverted and e-liquid is dripped into the outer tube until it is near the top (actually the bottom, but it is not inverted) of the inner tube. The EVOD is advertised as holding 2.4ml, but I think this statement is pretty optimistic. In my tests I was only able to get about 1.8 ml into it. When filling, care must be taken not to get any e-liquid in the inner tube, and this is the part that gets a little ungainly. The unit must be held at an angle to avoid dripping into the center tube and that makes it difficult to see how much e-liquid is actually in it. Looking through the view port is helpful to see the e-liquid level, but then it is difficult to see the bottle tip to make sure juice is going where it’s supposed to. A syringe or needle tipped bottle helps with this process. E-liquid levels are a little hard to see in the viewport of the EVOD, but not unreasonably so. Because it is a center post design and that there is only a slim window for viewing, not much light penetrates the tank. Clear e-liquids are especially hard to see in dim lighting. The security of having a metal tank will likely make up for the small viewing area for most users, however. The performance of the EVOD is where the unit really shines. This is without hesitation the best clearomizer I have tried. Flavor and vapor production are excellent, with the 1.8ohm coil functioning well on both 3.7v and variable voltage devices. The bottom coil design is very effective at delivering e-liquid to the coil and dry hits are virtually nonexistent as long as there is e-liquid in the tank. After about a dozen tankfuls, there have been no dry or burnt tasting inhales and flavor has remained consistent. There has also been absolutely no leakage, something that has been reported in earlier Kanger designs. Draw is a little airy compared to a standard cartomizer, but certainly not annoyingly so. The EVOD seems just a little tighter than its larger M-T3 sibling. An impressive trait of the atomizer in this unit is that it seems to be very tolerant of higher voltages. Vapor gets a little harsher as the voltage is increased beyond 4.5v, but does not seem to damage the atomizer. I must admit that I accidentally set my voltage at 6v while using the EVOD, resulting in several nasty burnt hits. After some initial concern that the wick was drying out, I realized my mistake. I set the device back to 4v and everything was wonderful again. There seems to be no residual burnt taste from my little error, which there surely would have been with many other cartomizers. The Kangertech EVOD BCC has some drawbacks, but its exceptional and consistent performance make it an excellent additon to any vaping arsenal. Great flavor production and juice delivery set it apart from many other clearomizers on the market. At $8.95 it is reasonably price and replaceable coils at less than $2 make it very cost effective. The hard to see liquid level and filling process are minor annoyances compared to the functionality of this unit. Note: The EVOD BCC reviewed here was purchased from LiteCigUSA, a trusted supplier of Vaping Guides.